After a quick lunch at one of my favorite taco joints in Milwaukee, I decided I would shop around. I was really only looking for some tortillas for my kids, and an avocado for my wife, but I decided I would browse. Browsing typically gets me into trouble when I am at a grocery store. Go figure. This time around I checked into the seafood section and found an octopus. I have been thinking of octopus for some time now and wanted my family to experience it. 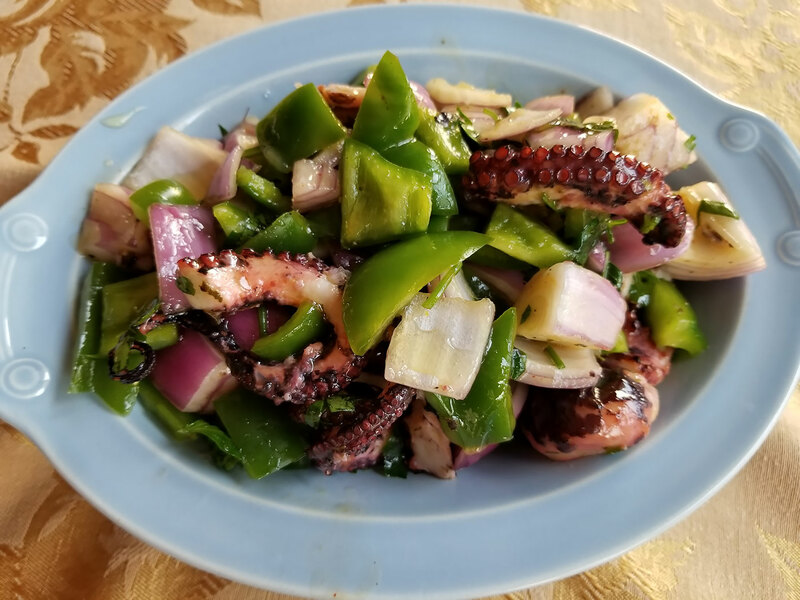 I grew up trying octopus from time to time, along with conch and snails. My parents were good like that so I figured I would make attempts to let my kids experience that as well. The first thing that came to mind was a grilled octopus salad, and that is what I stuck with. This octopus salad is not only really easy to make, but it is super refreshing. Start by bringing a large pot of water to a boil. Season the water with some salt, lemon, black peppercorn, and serrano chili. Place the octopus in the water and boil for 45 minutes. Remove the octopus and place in a large boil and rinse it with cold water. Drain the water and then drizzle with 1/4 cup of the olive oil. Let the octopus rest for about 30 minutes. Chop into large pieces and heat up your grill. Once your grill is heated, place the octopus parts onto the grill, and cook for about 5 minutes, turning along the way. Your goal is to get some of that grill char onto the octopus. After 5 minutes, remove the octopus from the grill and place into a large bowl. Add the remaining oil, lemon juice, salt and pepper, onions, parsley and bell pepper. Give that a good toss and get ready to serve. I loved it. The texture of the octopus is spot on and the flavor from the great olive oil and lemon juice is super refreshing. Did my kids like it? Not sure but at least they tried! 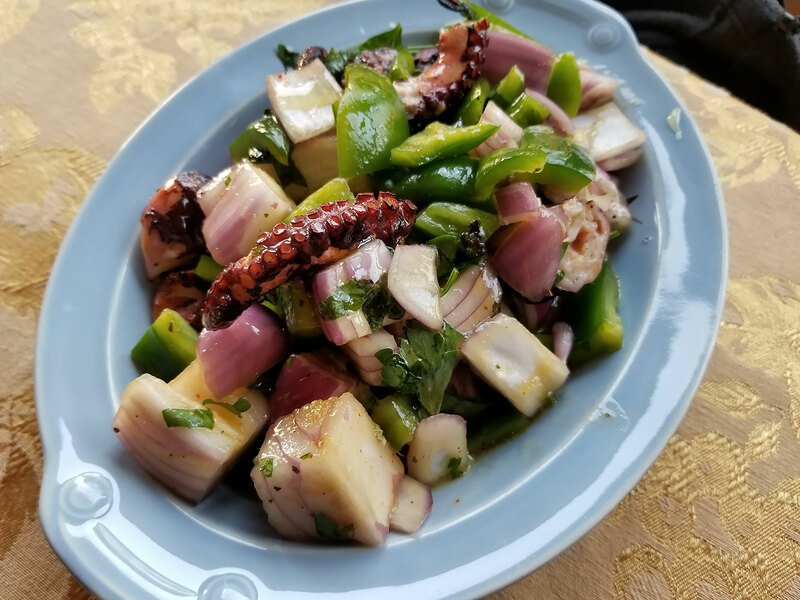 This grilled octopus salad would be really great during the summer months so I suspect I will return to that seafood aisle at my local Mexican grocery store and have them try it again. Have you tried octopus, and do you enjoy it?